MUST WATCH: Show Me Your Fingers And I Will Tell You Who You Are! Palmistry or chiromancy from the Greek word "Kheir" means hand and "manteia" means divination, a state of characterization and foretelling the future through the study of the palm, also known as palm reading or chirology. This practice is found all over the world, with different cultural variations. Those who practice palmistry is called palmists, palm readers, hand readers, hand analysts or chirologists. By reading the palm, palmist can evaluate a person's character or future. A palm reader usually starts by reading the person's "dominant hand" (the hand he or she has written with or uses the most). In some traditions, readers also examine the characteristics of the fingers, fingernails, fingerprints. 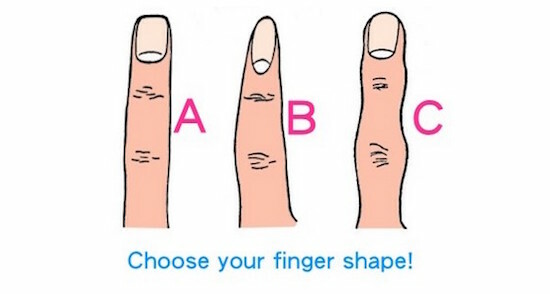 See the picture below and start examining your fingernails if it tells your characteristics. - You prefer to keep your emotions to yourself so the others may think that you are cool and strong. - You are a very emotional person, but you always keep it from others. Once the person knows you well, you will have a good relationship with that person. - You really care about your loved ones, but you are cold towards those people that are not close to you. - Once you have given a task, you will see to it that you will finish it even though you are not happy doing that task. - You are a person with a big heart because it is your passion to help those who are in need. - You are a very honest person and you don't know how to tell a lie and that makes you fair person. -You believe in true love and always waiting for someone who will understand and love you the way you are. - You are tough in decision making. -Even you are a sensitive person, you appear to be a strong and independent person. -You always remain calm in any situation. -You are afraid to be hurt by the people you love. -You will not hold on to anything that makes you angry. - You are not in favor of trying new things and hate challenges. - You are a very quiet person that you do not open your problems to other people. - You know what you like and dislike. - You have a very high ego when you think you are right, but know how to apologize when you did something wrong. - You know how to forgive. Watch the video below for further details. Hope you have learned a lot from this article.